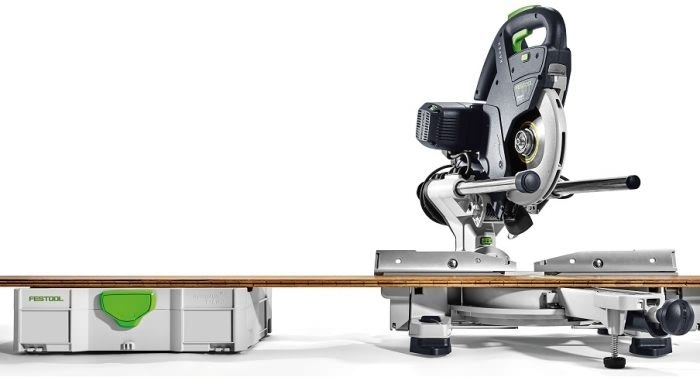 The Festool KS60 Mitre Saw has launched this February and with the release of their new airstream range, it’s been an exciting start to the year for Festool as they continue to innovate the industry to create better and more intuitive products for the end user. We take a look at the newest Festool Kapex Mitre Saw and the different versions now available. For the tradesman or DIY user, the new Kapex KS60 sliding compound Mitre Saw features a compact and ergonomic design with ease of movement from the ergonomic hand grips and an integrated cord holder for easy transport. The new Kapex model is a powerhouse in minimising waste. The error-free transfer of the angle with the bevel and LED spotlight will allow work to be done quickly and accurately, with increased visibility of the scribe mark. In terms of application, the mitre angles are up to 60 degrees on both sides and can be adjusted extremely easily and accurately for the user to set different presets and to interchange via locking positions. This will allow you to increase productivity, achieve consistency and get the job done faster. This mitre saw features dual-bearings and a twin column guide to guarantee smooth and reliable precision cutting. Tradesmen will find projects much easier to carry out thanks to the precision and versatility of this new Kapex. For example, when cutting on the floor users can use a SYS-1 Systainer as an extension, which is ideal for floorlayers. Having visited Festool HQ a few months ago for a first glimpse of the KS60, it was interesting to hear how they innovate new products based on real user applications and from customer feedback. Essentially, Festool have been working hard to eliminate any unnecessary weight to the model to make it as light, compact and ergonomic as possible to make this Kapex Mitre Saw effective and ideal for any applications. The new Festool Kapex is now available online and in each of our showrooms. For any questions about the new Festool Kapex Mitre Saw, call our sales team on 01223 498700 or visit your nearest ATC showroom.